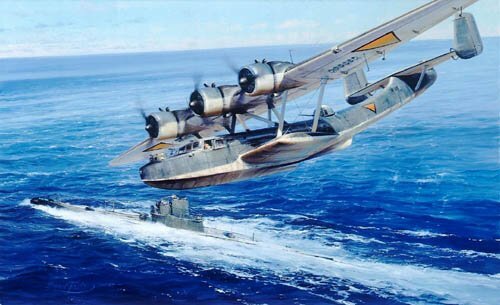 A Dornier 24 flying boat of the Royal Netherlands Navy sights the Japanese invasion fleet off Kuching, British Borneo, 23 December, 1941. By chance it also sighted patrolling Dutch submarine K-X1V on the surface, unaware of the enemy position. Receiving the pilot’s signal “enemy to the north east”, the submarine quickly engaged, sinking two ships and damaging two in one of the first Allied successes against the Japanese in World War II. Overall print size: 27" x 19"
An exclusive from the Military Gallery - a limited edition signed by Dutch veterans of World War II. Each print is signed by 2 survivors of the flying boat’s aircrew plus 3 crew members from submarine K-X1V.